The ancestral worship of Oro amongst the Yoruba people of Southwestern Nigeria in West Africa, mysterious as it is, still remains the most revered of womenfolk, in that they play an essential role during its festival by forming an elaborate gathering to dance round the entire community. They tie their headgears ‘gele’ combatively around their waists, stopping for a while at various compounds before they proceed in dance array to the next quarter. This important performative event is called ‘Iwode Are’ (dance procession). The centreplace of women in Yoruba festival drama as well as the theatrical repertoire of indigenous ceremonial dance performance shall be examined. Dance procession (Iwode Are) usually takes place on the very first day of the Oro festival when Aro the traditional religious recluse of the ancestral cult will be carried shoulder high by able-bodied men from his ‘Paaga’ (homestead) across the ancient market of Idofin into the sacred grove of Oro as a religio-civic norm. The passage is characterized by ceremonial dance performances whose mainstay of event is depicted during the dance procession. During Iwode Are dance performances manned by Akewe the lead vocalist of Oro, the women in various factions will hold Odan leaves that symbolize peace in their hands, wave them joyously in the dance round each compound(agbo Ile), practically ‘chasing evil occurrences out of the community. Omo Idofin, e mura s’ Oro, Ire ni, Ire ni n’ile yi o, Ire ni! Do not sleep the sleep of death. Awa la l’Oro,awa la funwon l’ase. K’a ma s’oro,ki won maa se keeta! Lasogba, it is left to you as our advocate. The land belongs to us; we leased the farmland to them. Is to boycott its efficacy with backbiting. 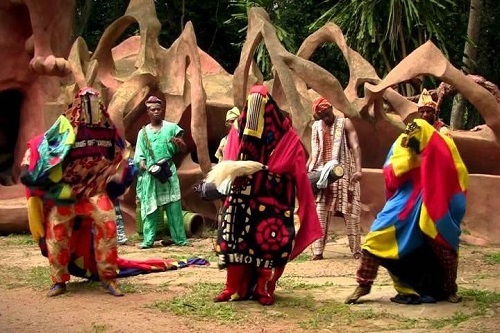 The ‘Iwode Are’ dance procession, as observed in the nature of its form, is one of the participatory sequels of the ritual performance whereby a certain degree of expressiveness is left to the women while the men are, in a nutshell, at the ‘mercy of the womenfolk’. No musical ensemble is used during this festival drama. The whole act is performed with stamping dance and daring songs. This communal fare is exclusively women’s role. It is their custom to eventually ‘sweep’ the ancient market of Idofin with Odan (baobab) leaves after the turnout to signify total purgation of the land from every form of pestilence, and cast the shreds on the passage of Aro the traditional religious recluse in his majestic public procession from his homestead into the sacred grove to symbolize the movement of Lasogba from Old Oyo to Igbo Iwera. The women continue their performance afterwards, seemingly daring the male members of the community as the moment in which Oro cult usually places a curfew approaches. If you’re truly man enough! You daren’t prove your manliness! The significance of such songs is to emphasize the feminine impact on the religious observance. It is a sort of retaliatory attack on the men. The most appealing segment of Oro festival drama and the theatrical amongst the people of Idofin is the midnight ‘prowl ‘of Oro rancoteurs. The names of these nocturnal ‘beings’ are varied by their repertoire and purposes for which they are formed. One such rancoteur who is noted for abusive phrases and laughter provoking wit is popularly called ‘Gbatareyo’ or ‘Adegbee’. In his mischievous drama, the Gbatareyo indulges in ludicrous role-playing and bawdy dialogue between himself and other factions at a place just a stone throw to the threshold of their targets mainly to taunt or humiliate them. The Gbatareyo’s tactic is to expose the shameful acts of certain individuals in the community to the knowledge of the public rapt ‘listening ears’. The extemporous dialogue of the Gbatareyo is replete with ridiculous subjects and secret occurrences from one end, the specific names of the persons involved in the palaver are vocalized in one voice at the other end of the threshold (gbagede) by the principal Gbatareyo who plays the respondent to the amusement of the listeners. Atari o j’Oorun o ran! Doesn’t allow the sun to rise! By the feature of the scalp in question, everyone in the vicinity knows full well the person whose head matches such a connotation. In some respects the sort of disparaging references that the Gbatareyo habitually pose concerning his victims to arouse a rancorous laughter in the locality can lead to verbal exchange of ‘hot words’, curses and stone-hurling brawls from the persons who could not bear the offensive name-calling. Won lo o j’omo eran gbe. They say you stole a goat. Ni yio o se e! If the antithesis does correspond! That made me to fall down so cheaply! The other nocturnal ranconteurs who are considered to be the entourages of Oro ancestral cult are Kelesegbe and Orokoro. It is a common belief that these minstrels are the spoke persons of Oro. They make use of what is known as the Oro rhomb (Aja Oro) to eliminate evil occurrences from the community. To the Yoruba people of Idofin in Southwestern Nigeria, the rhomb serves as the menacing watchdog of Lasogba the eponymous founder of the town. Awolalu, J.O.and Dopamu, P.A (1979). West African Traditional Religion. Ibadan: Onibonoje. Frazer, J.G (1933). The Fear of the Dead in Primitive Religion. London: Macmillan. Kirk, G.S (1973). Myth: Its Meaning and Functions in Ancient and other Cultures. London: Cambridge University Press. Adedeji, J.A (1967). “Form and Function of Satire in Yoruba Drama”. Odu Vol.4 No.1. 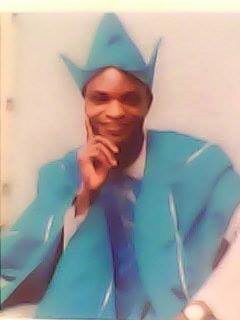 His books The Wrestling of Jacob, Praying Dangerously: the Cry of Blind Bartimaeus, and Death and Suicide In Selected African Plays, are available at Amazonand select bookstores.